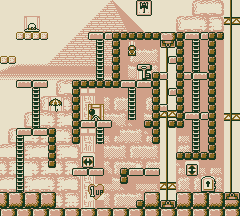 Stage 5-3 is the third level of the Desert in the Game Boy version of Donkey Kong. The level is one of the bigger levels in the game. Mario starts off near the first Ladder. There is a 1 UP Heart over to the right but a Skeleton guards it by throwing bones so it must be avoided if Mario wants to 1 UP Heart without losing it immediately. He must climb up the first ladder then climb up the second ladder and make a Jump over to the next platform where there is another ladder to climb. He must go right where he can get a Super Hammer which can be used to defeat the Skeleton guarding the 1 UP Heart if he hasn't gotten it already by going down the Elevator on the right and going over to the Skeleton. Mario must go down some ladders (or go down the elevators) to get to a ladder block then connect it to the unfinished ladder leading to the switch and he must get up to the platform next to the elevator going up and once on the platform he must go left then activate the Road to put it between the two platforms below the ladder leading to the Key's area. Mario must climb up the ladder up to the lever and flip the lever so the elevators go down and he must go over to the ladder on the bridge and climb it up to the key's area. Mario must grab the key then go to the area where the elevators are while going down some small blocks to the bottom, once at the bottom he must take the key to the door to end the level. Hat: On the second pair of falling blocks. Mario needs to get onto the first set of blocks then jump up to the second set to get to the item. Parasol: To the right of the second Ladder. Bag: In midair in the area with the Key.